Where do I even start? I have always been a ‘dog person’. Way, way back in the day, I fostered Great Danes for a short period of time. Then I was involved in Recycled Rotts. But, after losing my special needs Rottweiler, I got away from that breed. Sharon as a young girl. I had wanted a greyhound since I saw my very first one in Colorado as a very young girl. I promised myself that one day I would have one of those graceful creatures. I have been in love with this breed since 1966. So, in July of 2011 (about 45 years after seeing my first one) I finally got my greyhound. We adopted Ticket from American Greyhound to help our other dog Roman heal his broken heart after losing our beloved Rott, Presley. We brought Ticket home, and he moved into this house like he had been here his entire life. I was so in love with this boy! He healed all of our hearts, and Roman was happy again. I also fell in love with the American Greyhound family. I also fell in love with the American Greyhound family. Ticket’s foster mom, Paula Cappoziello, was someone I admired from day 1. I remember leaving Petco with Ticket and seeing her cry so hard when he left with us. I promised myself….one day I will foster these graceful creatures. I remember my first auction and Jeff asked the foster families to please stand; and I cried happy tears seeing Paula stand up knowing I had adopted her foster boy, and I was so damn proud of her. It was so heartwarming seeing these people and knowing they give of themselves unconditionally for these animals. I wanted to experience that. As I became more and more involved with American Greyhound, I was lucky enough to go to Coldwater Prison to help bring dogs back to their forever families upon their graduation from the TGIE program. On my 2nd trip up to the prison, I was going to be transporting several dogs back to Jeff and Barb’s house. As we were getting 3 of them in my car and I was getting ready to leave the prison grounds, someone asked me “will you be able to help us by fostering one of them”? And out of somewhere deep inside my body with no hesitation came these 5 words “yes, I will help you”. That afternoon I came home from Jeff’s house with my first foster. Her name was Rita and she was a dark brindle beauty. I was forever hooked. The love and affection I give these dogs is paid back to me ten-fold. All they want is that… love. I foster because these dogs need us. I foster because these dogs need us. Whether they come straight from the track, or the prison program, or are a returned dog, they need us. They need to know they will be safe, and loved, and fed and wanted. They need to know they are now retired and don’t have to race anymore. They need to know they will always have food and fresh water, and a warm bed. They need to know we will help take away their fear of stairs, and glass doors, and scary noises like thunder and fireworks. They need to know they will forever and always be loved and cared for. I foster because it makes my heart warm. I foster because it makes my heart warm. I have had dogs for as little as 3 days; and as long as 10 months. And yes I get attached to each and every one of them. I have foster failed – Dodge is my TGIE foster fail, and Charity is my brood mama farm girl I foster failed with. I had Chance, a Lurcher (who was an abuse case) for an entire 10 months. He was the happiest dog I ever had, he could turn the stove on by wagging his tail. He should have hated people for what was done to him, but he didn’t. He loved people, especially little kids. Believe it or not, I didn’t fail with him because he was so very, very special. Chance needed a family with kids and my grandkids live in Minnesota. He lived to make little boys happy. He was my heart dog, but I knew he needed something more than just me and my husband and our other dogs. He needed a little boy!! That’s why it took forever to find him his home and he finally got it. He is living a wonderful life with Sue Romans and her husband and their little boy Liam. This is why I foster… for these happy endings. They might take a little while to become a happy ending, but good things come to those who wait. I foster because I love making other families as happy as I am being a greyhound owner. I foster because I love making other families as happy as I am being a greyhound owner. I have received countless thank-you notes and cards and letters and gifts from the families that adopt American Greyhound dogs, and knowing I was part of that process makes me so happy. I foster because I promised myself I would… and I never break my promises. These dogs need us, but more than anything else, I need them. I need their happy faces, their unconditional love; their cold noses on my face; their appreciation and gratefulness that they are off that track; I need their quirkiness and their endless love. That is why I foster!!! Apply to foster for American Greyhound at agrey.org/AGFosterApp. 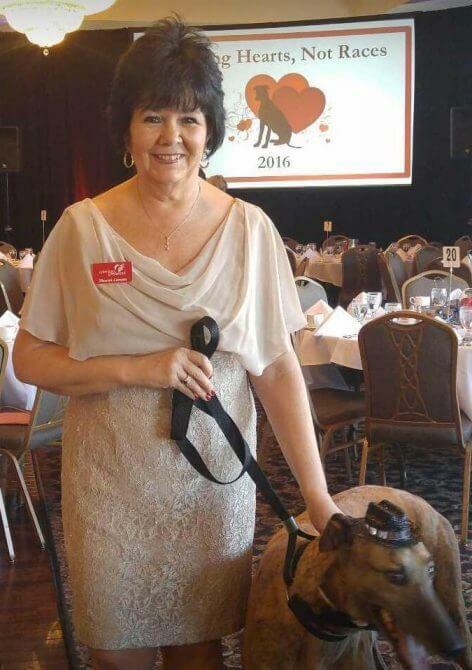 Want to attend the annual Winning Hearts, Not Races Benefit Auction on April 1? Get tickets by March 24 at agrey.org/whnr2017.